In this short documentary, Martin Machado tried to answer some of the common questions that he usually gets about shipping. "The footage I took myself using fairly basic cameras that I could fit in my pocket while I was on the job as a deckhand. The story follows me on my six month journey around the world on a container ship which was on a run between New York and Singapore via the Suez Canal"
Mid-Pacific, the 40th day at sea, and the radar shows us all alone again. Lunch is the usual offering. The ship rolls in moderate swells, the air is stunningly clear. Joseph Conrad said that the peace of God begins here, 1,000 miles from the nearest land – but who would trade a fortune and months of life to experience it? Many cargo ships have a couple of spare cabins which they will sell to paying passengers. Possible routes range from a few days across the Mediterranean to epic world voyages. French shipping line CMA CGM offers a trip from Tilbury, Essex, to New Zealand and back for €10,000 with only one condition: an upper age limit of 80. It takes three months and a certain sort of traveller. Luxury aircraft, trains and yachts have their pleasures but my favourite transport is a mighty freighter loaded with steel boxes. I loved all 125,000 tonnes of mine. She showed me another world. The seafarers thought I was crazy. “Why are you here?” they asked. “To see what your lives are like,” I said, reluctant to admit the other reason. Since boyhood I had dreamt of setting sail on a ship bound for far away. When I confessed, the sailors laughed. They had felt the same thing, when they were too young to know better, and signed up. My captain, Henrik Larsen, a Dane, snorted when I asked if he came from a seafaring family. “No, no,” he said with a growl. He did not live near the sea, either. I will never forget mine. Felixstowe to Los Angeles via Suez, aboard the Gerd Maersk: two months of ocean travel, foreign ports and mysterious seas – what could be better? Well, all that, plus a cocktail served on deck, mixed company and decent cooking, you might think. 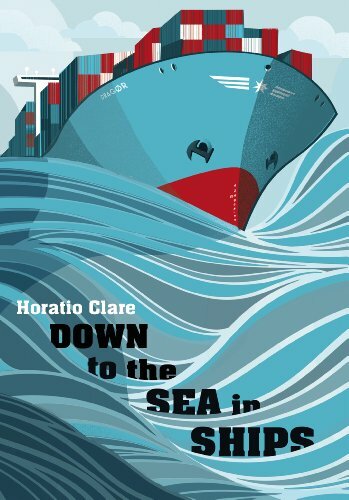 Container ships tend to offer male crews, unsophisticated cuisine and stilted conversation – plus mine was alcohol-free. So surely better to opt for a cruise? Well, cruises bubble with entertainments and society – they are variations of land-life, afloat. Freighter travel is utterly otherwise. Just booking a berth is an achievement. There are companies to do it for you, offering cabins (I avoided paying by becoming the shipping line’s writer-in-residence), but securing your welcome, by cash or cunning, takes patience. The ship may not show up. I once chased one to Rotterdam and caught her in Antwerp after a harbour pilots’ strike. You may become entangled in deviation insurance: the owners ask you to cover them against the possibility of you dying or injuring yourself in a way that delays the ship. Few insurers welcome million-dollar-a-day compensations: I ended up going for a blend of fudge and bluff. Everything is justified when you climb the gangway, a bouncing ladder up the steel cliff of the hull. Shipping companies smart enough to carry passengers also provide decent cabins. More Premier Inn than Savoy, but with a view, beyond the container stacks, that no hotel in the world can beat. The Gerd Maersk had a crew of 21; I was the sole passenger. The English Channel was familiar but soon we were into the fogs and whales of the Bay of Biscay, then the Strait of Gibraltar, a seaway of multiple weathers and the supercharged feeling of two great planets, Europe and Africa, swum almost into one another’s embrace. It does not take a seer to stand on the bridge of a ship between the Pillars of Hercules and feel the exhilaration the Phoenicians must have known when they first found the Atlantic, or the anticipation Norse navigators experienced when they discovered the Middle Sea. We were excited because Algeciras, Spain, is a favourite of sailors: the port is walking distance from the town. We took on thousands of tonnes of cargo and were gone the next morning. We passed Sicily, Etna smoking in the distance, and soon felt Egyptian heat. We spent the time talking of superstitions and legends, of captains who went mad or died or disappeared overboard, and of the best places in the world. Portugal for fish, the captain said; Thailand for the girls, in the old days, the sea dogs laughed. Brazil, someone said, dreamily – but then we remembered ourselves, and our wives and girlfriends, and spoke about food and the best places to live, popular topics with sailors. Everyone put New Zealand in the top three. “The sea, the hills and the air are green,” said our Romanian first mate. Because the ocean trade’s busiest route, from Europe to China, runs through steamy latitudes, everyone longs for the temperate zones, especially the engineers, whose screaming, infernal, cathedral-high machine radiates 40C of heat. If you like machinery, the engine room is paradise, but I spent weeks on the bridge, greedy for the oceans, birds and flying fish, dolphins, whales and weather. Overcapacity and shrivelled world trade means giant vessels, half empty, passing each other in endless relay. “Tell him the captain got drunk and threw it off,” the captain growled. We got our own back a month later when we reached Hong Kong to find everyone else had run from a typhoon, leaving us with as much freight as we could carry. When the Gerd Maersk curved back out of the harbour, stretched to her full capacity and heeling over, we were so heavy it took us 20 minutes to heel back. Without women, families and alcohol, men do not become macho or slovenly. They are gentle and sensitive towards one another – restrained but professionally cheerful. Our days were measured in meals. The men worked or slept, and I solicited sea stories and wrote and read and dived into deep sleeps, rocked by the great ship, lulled by her diesel heartbeat. “You think everything is interesting,” said our Danish second mate one night, when I appeared at 3am exclaiming at the sight of the whole South China Sea covered in fleets of fire. “Squid fishermen,” he explained patiently, as he threaded our monster between them, and what had seemed flame resolved to blazing electric light, apparently irresistible to curious squid. There were times – the egress into the Singapore Strait, the arrival in Hong Kong, and our night navigation up the Saigon River, under hot cloud, with our foghorn lowing and Vietnam like a dark dream – when all three mates came up to watch and learn from the captain. Shipowners, upon whom world trade depends, aim to achieve the predictability of conveyor belts but the sea is the least predictable environment. Saving God, there are only three powers out here: the weather, what ships can manage, and what captains decide to do. It is a difficult world to imagine if you have not seen it. No camera or digital fake can do justice to the experience of being on a ship in a real storm. We ran from a tropical cyclone named Nesat but glancing blows from its tail slammed us, groaning, into dark giant hills of murderous water. Cargo shrieked and the huge ship shuddered, caught in a contest between sea and wind. After reeling, sleepless nights we plunged through the bruised colours and violent swells of typhoon days. Travelling on freighters grants insight into the extremity of nature, and into the nature of men. Conrad and Melville wrote piercingly about characters because they had seen them bared. The oceans permit no bluff or flummery. The tiny crew who bring you and all the world’s goods safely home are a cross-section of male experience. I had family men from the Philippines, missing their wives and children for nine months at a stretch, and young men missing girls, and men tormented by money worries, and others whose optimism and drive never flagged. The barely skilled and the extraordinarily able each have a place, a rank and a role. The merciless ways in which we divide the world into the cherished and rewarded, and the cheap and expendable, often differentiated only by luck and passport, is plain on a cargo ship. “You have to be strong with yourself,” as one of my chief officers put it. Our captain practically danced us through the Singapore Strait, navigating by lights, depths, charts, instinct and instruments all at once, as the thick tropical night was stormed with charging ships. Crossing the Pacific took 13 days – days of utter isolation on the far side of the world, under luminous air and nights of towering silence. We pushed through dawns of strange weathers, where the clouds came down to the sea in arches and we sailed from day to night and back again. “People imagine it,” the captain said, with the nearest land a week away. Unlike most seafarers, paying passengers are likely to have some limited internet access, and everyone loves DVDs on ships, though where once these were watched communally, now most people retreat to their cabins. There will be a gym, and you may even have a swimming pool, as we did – a gap between the containers, filled with seawater and fat flakes of soot from the funnel. I found relief in the work I had to do: it would have felt strange to be idle, when everyone else was on an unvarying shift pattern, and mostly either working or asleep. A passenger has, perhaps, the perfect perch from which to read and write. 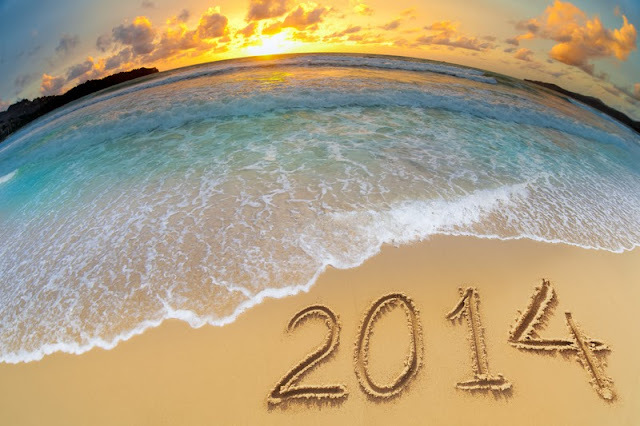 The experience will not make you a seafarer but you will have done some seafaring. You will know how vast the oceans are, and how strong quiet men can be, and what it feels like, after weeks of waves, to see a faint line harden into colour and form, and know that you are nearing land and “life” again. For some the main attraction is being able to travel without flying; for others it’s all about experiencing the peace of ocean travel without the distractions of a cruise ship. The appeal to the ship operators is less clear: the passengers’ fares make a negligible difference to their profitability. Perhaps more important is offering distraction and conversation for the crew, as well as potential PR benefits. A huge range of routes are available. With a week you could go from Le Havre to Malta, or Antwerp to Genoa. In 18 days you can go from New York to Suape, Brazil; in 45 from Tilbury in Essex to Sydney, via New York, Jamaica, Colombia and Tahiti. Timings are approximate – ships are often delayed. Between £70 and £110 per day is typical (longer voyages work out cheaper per day), including food. Alcohol is usually extra, but at low, duty-free rates. Cabins are usually en suite and on the outside of the ship (though containers can obscure the views). There is often a pool, passenger lounge and gym, while a steward will usually be on hand to make beds and clean cabins. Most ships have a handful of cabins, though they often sail without filling them all. It’s rare for there to be more than 12 passengers – any more and maritime law requires a doctor. How? Book early, as popular routes get booked up a year or more in advance. Earlier this month, Chris Turney set off from New Zealand with a team of 36 people aboard the Russian research ship Akademik Shokalskiy, bound for Antarctica. The goal of this modern Australasian Antarctic Expedition (AAE) is to duplicate some of the observations and experiences of Sir Douglas Mawson's original AAE team, which sailed for the southern continent 102 years earlier. 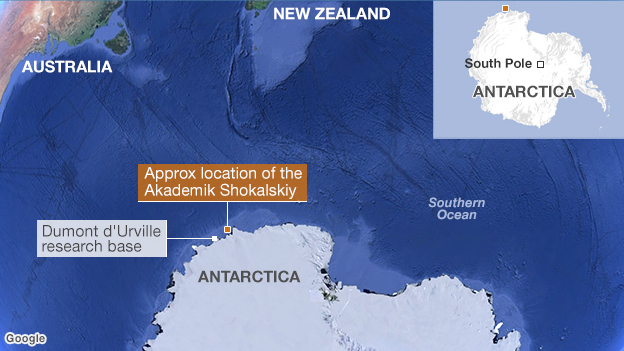 But on December 24, the Shokalskiy found itself icebound far off the Antarctic coast. Alerted by radio, a Chinese icebreaker, along with other powerful ships, steamed through the pack to rescue the full team of 74 scientists, students, and crew marooned aboard Turney's vessel. There was no fear of any loss of life, but as of December 30, the Russian ship was still stuck fast in the pack, and it was not clear how soon it could be freed. For me, all this brings home just what extraordinary deeds Mawson's AAE team accomplished between 1911 and 1914. I confess to my own bias in favor of those Edwardian adventurers, as I recently wrote a book called Alone on the Ice about Mawson's landmark expedition, as well as an article about Mawson for the January 2013 issue of National Geographic, titled "Into the Unknown." Still, let's ponder just what phenomenal challenges Mawson and his men overcame a century ago—challenges that no one today seems capable of duplicating. Had Mawson's ship the Aurora gotten stuck in the ice in December 1911 or January 1912, it is entirely possible that all 28 members of Mawson's team, as well as the dozen or so ship's crew under Captain John King Davis, would have eventually died, either of starvation or hypothermia. In those days, there was no hope of rescue from another ship. Davis and Mawson had no radio contact with the outside world, and no one in Australia knew where the ship was. There were no icebreakers back then. 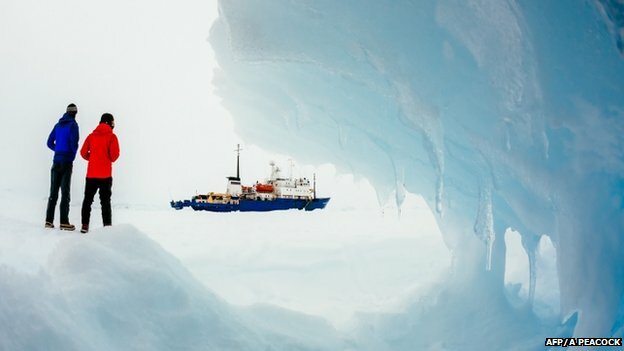 If a ship got stuck in the ice in the Arctic or Antarctic, the only hope was to winter over onboard and hope the next summer's thaw freed the vessel. A few years after the AAE, the pressure of heavy ice sank Sir Ernest Shackleton's Endurance. His only option left was an incredible over-ice trek to Elephant Island and an open-boat journey to South Georgia Island (by dead reckoning in a tiny lifeboat saved from the Endurance), now considered one of the great survival deeds of all time. 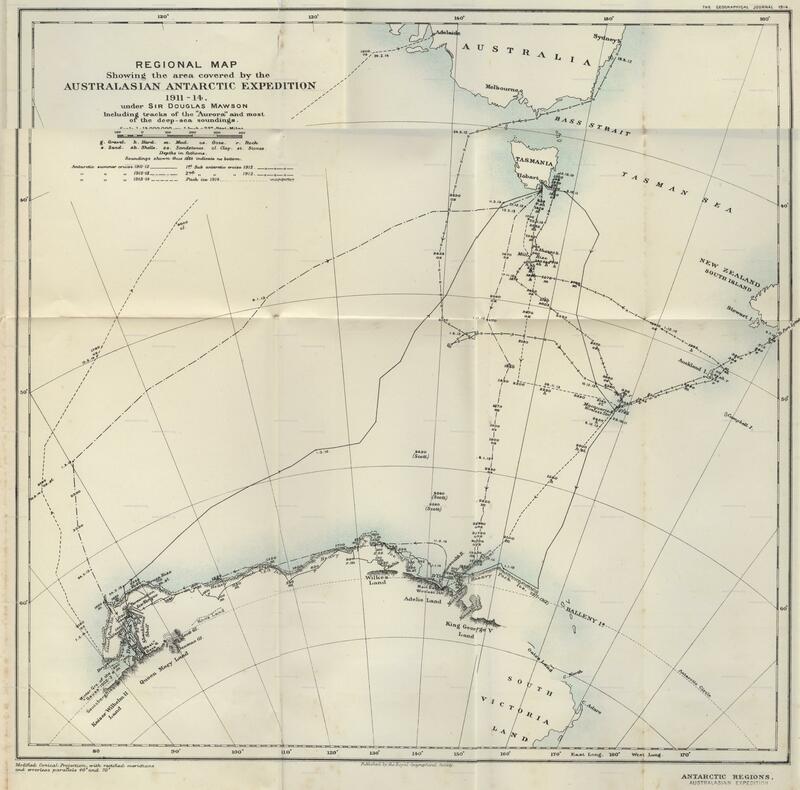 The route taken by the Australasian Antarctic Expedition, showing glaciers Mawson named for Mertz and Ninnis. For Mawson, simply finding a cove in which to build a hut presented a monumental challenge, since the 2,000-mile (3,700-kilometer) swath of Antarctica that he hoped to explore was a blank on the map. Once they found Commonwealth Bay and built the hut, Mawson and his crew planned to winter over, knowing that the scientific research and exploration that were the purpose of the expedition could take place only during the second summer. Turney's journey was planned for four weeks; Mawson counted on a minimum of 15 months. In the end, for seven team members, the AAE lasted almost twice that long. In the summer of 1912-13, Mawson sent out eight different three-man teams hauling sledges, each in a different direction. The amount of science and discovery those teams accomplished, as they ranged as far as 300 miles (555 kilometers) from the hut, was unparalleled before or since. Given the short span of Turney's voyage, there was no intention of venturing more than a few miles from the hut—if they could even reach it. It's all the more astonishing, and a measure of Mawson's huge ambition, that in addition to his own 18-man contingent at Commonwealth Bay, Mawson set up another base. He appointed the tough, unflappable veteran Frank Wild to sail with seven men in the Aurora a full 1,500 miles (2,700 kilometers) farther west along the Antarctic shore to establish an autonomous second base and carry out its own program of science and exploration. Wild's situation was even more perilous than Mawson's, for in the end he had to build his hut on a moving ice floe, not on bedrock. At any time during the winter, the ice shelf could have calved into the sea, taking all eight men and the hut with it. And by February 1913, Wild and his men had no idea if the overdue ship was going to pick them up. Should it fail, the men would've had to kill enough penguins and seals to survive a second winter, still with no real hope of rescue, for no one in the world except John King Davis knew where they were. The feat that led Sir Edmund Hillary to salute Mawson for pulling off "the greatest survival story in the history of exploration" reached its climax (or nadir) in January 1913. Having lost his partners Belgrave Ninnis in a crevasse fall and Xavier Mertz to starvation, Mawson—severely debilitated and almost out of food—man-hauled his half-sledge 100 miles (185 kilometers) back to the base camp hut in Commonwealth Bay. On January 17, he broke through a snow bridge and fell 14 feet (4.2 meters) into the dark abyss of a crevasse, checked only when his hemp harness rope caught his fall, the sledge having providentially stuck like an anchor in the snow. On the verge of giving up, Mawson pulled himself hand-over-hand up the rope and reached the surface, only to have the lip of the crevasse break, plunging him all the way back in. Summoning his last reserves of strength, he pulled himself up a second time, crawled onto firm snow, and passed out. A few years ago, the brilliant Australian Antarctic explorer Tim Jarvis tried to recreate Mawson's solo journey—although with all kinds of built-in backup and safety nets, including a film crew with a rescue helicopter and constant radio contact. At the end of his own journey, Jarvis was able to pull himself the 14 feet out of a crevasse (into which he had been carefully lowered by the film crew). Asked to do it a second time, as Mawson had to, Jarvis failed. On February 8, 1913, Mawson got back to the hut in Commonwealth Bay to learn that he had missed catching the relief ship Aurora by only five hours. Thus he and the six men delegated to search for his body resigned themselves to a second winter in Antarctica, in what has since been proved to be the windiest place in Earth at sea level. They pulled it off, despite one of the men going insane, as a result of which his companions had to post a guard day and night, for the man veered between begging the others not to kill him and threatening to murder them all. They don't make 'em like they used to! Ready for new digital challenges! It’s likely that you have heard about the drones patrolling the war-torn skies of Afghanistan, and maybe you’ve read about the drones that Amazon and Domino’s plan to use by 2015 for delivering products directly to your door, but have you heard about the Navy’s new underwater drone? In 2014, a year before the Federal Aviation Authority allows drone use in American skies, the Navy plans to launch the fruits of its five year, $56 million underwater drone project: the “Slocum Glider." These incredible machines will not require fuel but will instead use a process called “hydraulic buoyancy,” which allows the drone to move up and down and in and out of underwater currents that will help it move at a speed of about one mile per hour. Its slowness is not a problem, since the drone’s primary use won’t be for attacking enemy submarines or ships, but instead to stealthily move around under water, sending information to other military vessels. Currently the drones are being used to supplement sonar in collecting data, but it is hoped that they will eventually be able to assist in the detection and disarming of underwater mines and enemy submarines. The Navy has recently enlisted the help of Teledyne Webb Research to help maximize the potential of the drones in carrying weaponry and more advanced sonars. “Carrying a wide variety of sensors, they can be programmed to patrol for weeks at a time, surfacing to transmit their data to shore while downloading new instructions at regular intervals, realizing a substantial cost savings compared to traditional surface ships,” reads the Slocum Glider page on Teledyne’s website. Deployed from the submerged submarine USS Providence, the NRL developed XFC unmanned aircraft is vertically launched from a 'Sea Robin' launch vehicle (bottom right). The folding wing UAS autonomously deploys its X-wing airfoil and after achieving a marginal altitude, assumes horizontal flight configuration. Earlier this month, the Navy successfully launched a drone from a submerged submarine. Using the torpedo tubes to launch a buoy to the service, the drone then launches from a floating position within a canister. This year we celebrate the 40th Anniversary of the Endangered Species Act (ESA). President Nixon signed the ESA into law on December 28, 1973. Congress understood that, without protection from human actions, many of our nation's living resources would become extinct. There are approximately 2,100 total species listed under the ESA. Of these species, approximately 1,480 are found in part or entirely in the U.S. and its waters; the remainder are foreign species. Species diversity and environment health are part of the natural legacy we leave for future generations. Each plant, animal, and their physical environment are part of a much more complex web of life, where the removal of a single species could cause a series of negative events affecting many others. Endangered species serve as a sentinel, indicating larger ecological problems that could alter ecosystem functions. The ESA is both a mechanism to help guide our conservation efforts and a reminder that future generations deserve the opportunity to enjoy the same great benefits from the natural world. Today the ocean is a very different place than it was 40 years ago. Thanks to the ESA, we now understand many of the threats faced by marine and anadromous species and are bringing them under control. The populations of many listed species are increasing, aided by our recovery efforts and time. Still, the populations of many species continue to decline and many more species are being listed. NOAA Fisheries scientists are developing the next generation of ocean observing systems, which will give us Increased awareness of what's going on in the ocean, adapt our management, and respond to challenges of a changing climate. We will continue developing new technologies and management approaches, and our work with national and international partners, to ensure the ESA remains effective in an interdependent, rapidly-changing world. ESA Turns 40: What’s Your Legacy? In its 40 year existence, the Endangered Species Act (ESA) has helped recover over 30 species, including the Eastern Steller sea lion, and saved numerous other species from extinction. Today, the Act protects over 2,140 listed species. Here's the trailer for Shored Up, our new documentary about the barrier islands of the U.S., featuring Long Beach Island, New Jersey. Surfers, scientists, politicians and residents help bring us a birds' eye view of the beauty and danger of the living in these low-lying communities on our ocean's edge. Look for our Kickstarter campaign in October, or visit our website at www.shoredupmovie.com.